Now’s the time to raise your voice to help stem the rising tide of plastic waste, before it turns into a tsunami. The trends in the plastic plague are more than alarming, as we have written about previously. In BC, our recycling programs are partially to blame. 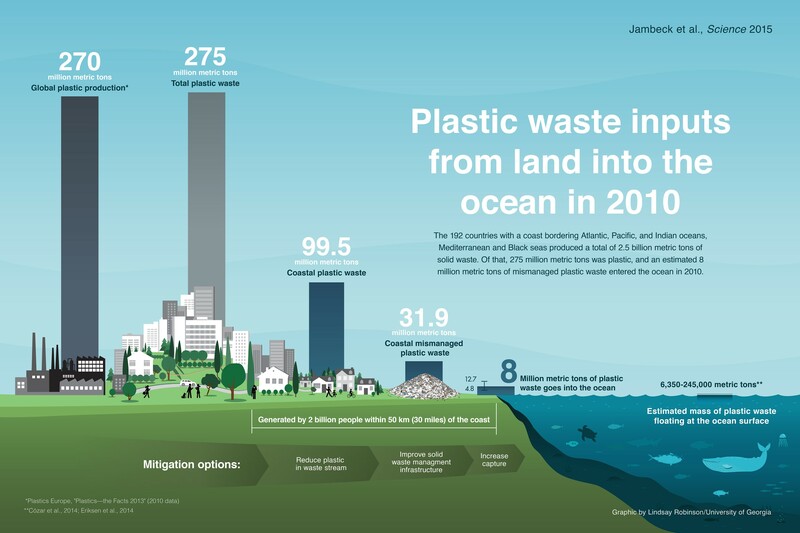 Expert environmental engineer Jenna Jambeck’s landmark 2015 Science study put a number on the amount of plastic leaving the land and ending up in the sea for the first time. The group of co-authors she led found that people added 8 million metric tons of plastic to the ocean in 2010! It is clear that we have a plastics problem. So what can we do about it? Here in BC, we have an opportunity to tell the provincial government how to improve its waste practices, and that it needs to go further than currently planned. In BC, beverage containers, all other residential printed paper and packaging (PPP) plastic motor oil bottles and a number of other products are subject to Extended Producer Responsibility (EPR) under the BC Recycling Regulation (respectively Schedules 1, 2 and 5), which is part of the Environmental Management Act. The EPR approach means that the producer's responsibility for reducing environmental impact and managing their product extends throughout the whole life cycle of the product, from selection of materials to its end-of-life. The Recycling Regulation requires producers to submit plans for collecting and managing designated materials. These plans spell out the producers’ responsibility to collect used products from consumers and achieve specified recovery rates, pay for all the costs of collecting and recycling, set fees or deposits for returnable items, and eliminate or minimize a product’s environmental impact. otherwise dispose of the waste from the product in compliance with the Act. Stewardship plans submitted by producers must be reviewed every five years and proposed amendments must be submitted to the Province of BC for review and approval. In many cases, these plans are submitted by umbrella organizations such as RecycleBC, rather than by individual manufacturers. The current PPP plan (approved by the BC Ministry of the Environment on April 15, 2013) has a target of collecting 75% of all materials (metals, paper, plastics, glass). The revised stewardship plan for PPP submitted by RecycleBC (the stewardship agency for non-deposit printer paper and packaging) proposes to introduce recovery rate reporting for paper, plastic, glass, and metal in 2020 – to assess current recovery rates and potential new targets – and would only start consulting on enforceable targets in 2021. So under the current proposal, there will be no reporting on aggregate plastic waste recovery for more than a year and no enforceable waste recovery targets for the balance of the three-year life of the amended plan, as RecycleBC conducts consultation. As a result there will likely be no enforceable recycling targets for at least another five years! Critically, the amended plan does not propose any reporting on plastic recycling by plastics type. This is wholly inadequate given that the RecycleBC program has already been in operation for five years, has developed more capacity for plastics recycling within the province and exports no plastics for recycling. There’s time to act to make this plan stronger. Importantly, the amended plan should commit to a 70% plastics recycling rate (not collection rate) by 2020. In the UK, public concern about plastic waste is at an all-time high thanks to the TV program Blue Planet, which showed the horrifying impacts of plastic on sea life. In response the UK government has committed to introduce a deposit-refund system for beverage containers (something BC already has). Working with the UK Waste and Resources Action Programme, retailers and producers have voluntarily pledged through a Plastics Pact to reduce plastics and recycle 70% of their plastic packaging by 2025. However, these same retailers and producers refuse to tell the public how much plastic packaging they are responsible for and are being roasted for this secrecy. Given BC’s head start in Extended Producer Responsibility, the province must do better. A key next step in reducing waste is to set ambitious targets for recycling, and provide British Columbians with transparency on the amounts of plastic sold into the province and what is actually collected and recycled. The amended PPP plan for BC as drafted today misses this mark. Feedback on the Revised PPP Program Plan can be provided until May 14, 2018 through an online Stakeholder Feedback Form or via email at consultation@recyclebc.ca.